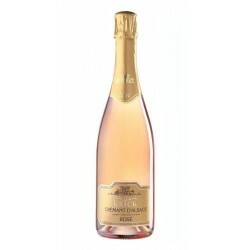 Its expressive nose develops aromas of flowers and exotic fruits. A rich palate with a beautiful aromatic presence. A wine that is not lacking in charm! The Gewurztraminer is the perfect accompaniment to spicy dishes and full-bodied cheeses such as Munster, but also for the strongest of spices or aromatic herbs. As such, it will be the ideal partner for many Asian dishes : Chinese, Indonesian, Malaysian, Thai and Indian cuisine. Un peu cher mais la qualite est la.